HDSL Line Isolation Transformer | Coil Winding Specialist Inc. Isolation Transformers are 1:1 transformer where the input and output are the same voltage and current. As the name suggest, it is for isolation only. Isolation transformers are used as a safety alternating current (AC) transformer to isolate the equipment that interacts with human from the line voltages. Isolation transformer are galvanically and electrically isolated between the equipment and the line voltages to prevents electric shock and possibly electrocution. Isolation transformers will also block direct current (DC) but allows the AC current to pass through. Uses of Isolation transformers are in power supplies for machines, equipmemts, computers, medical devices, or laboratory instruments. CWS designs and manufactures custom isolation transformer both for the low frequency 50/60Hz, 400 Hz and for high frequencies in the Khz to Mhz range. 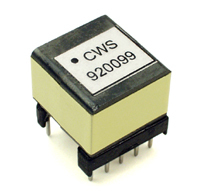 In addition, CWS also design and manufactures high frequency line isolation transformers for the telecom markets. An examples of such transformer is shown below. Good total harmonic distortion characteristics : - 75 dB max. DC Current : 100 mA max. Dimension: 0.55" x 0.55" . Height: 0.50"
2) Minimum order : $25.00. Samples available for large OEMs.